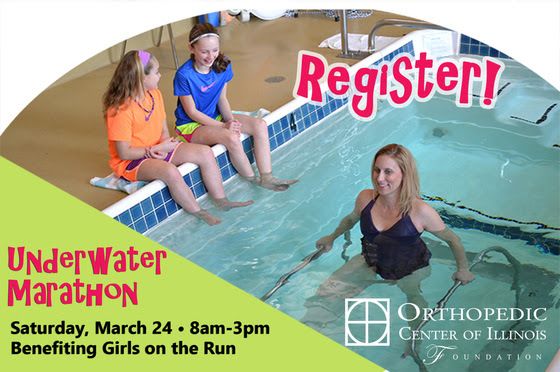 Join the Orthopedic Center of Illinois Foundation to support Girls on the Run of Central Illinois on Saturday, March 24, 2018, with a fun twist on the traditional relay race. Twenty-six athletes of all ages and skill levels will complete one mile each on the underwater treadmill in the therapy pool at Midwest Rehab. Runners must be 5’1” or taller to participate. Each athlete is encouraged to ask friends and family to pledge to support their mile so each runner can donate a minimum of $100. Sign up today to start your own fundraising page to share via email and social media. Prizes will be awarded, including Thirty-One Gifts totebags and Girls on the Run 5k entries, for fastest time and highest fundraiser. Check out additional event details on the Facebook Event. Midwest Rehab is located inside the Orthopedic Center of Illinois at 1301 S. Koke Mill Road (the corner of Koke Mill and Old Jacksonville Roads) in Springfield. Locker rooms are available for your convenience, but please bring a towel and bag for wet items.